This past Sunday was my annual holiday cookie decorating party. This year was number six, and I decided it was high time I get some professional training, so Madison and I headed over to Mrs. Wheelbarrow's Kitchen where we took a fabulous class with Gail Dosik from One Tough Cookie. We learned the basics of piping straight lines, corners, and circles. We learned how to decorate by forming a border with a thicker royal icing and then flooding with a thinner icing. Gail also shared some great advice on preparing cookies that I immediately incorporated into my process (see below for photo of rolling out dough between two sheets of parchment paper). In planning for the party, I decided I needed at least five cookies per guest, and I was expecting about twenty-five people, so I figured 150 was a nice round number of cookies to aim for. 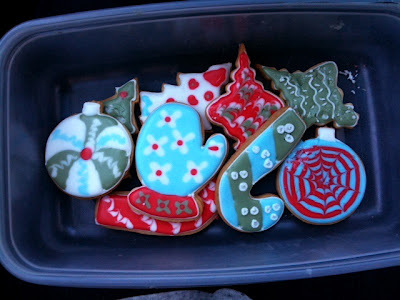 I prefer to decorate with gingerbread cookies, and I have used the same recipe every year. It isn't a very sweet cookie, which is good since royal icing is basically just sugar. And it has a nice peppery kick. If you prefer a milder gingerbread, you can leave out or cut volume of black pepper. While baking, I started to get nervous there wouldn't be enough, so instead of making three batches of dough I went for five. I have about a batch worth of dough left in the freezer. After baking four of the five, I realized I had better stop. I had hit a grand total of 294 cookies. In addition, Madison brought over two plates of traditional sugar cookies: ten christmas trees, 13 stars, and 11 men. Inspired by the professionals from the class, I decided I would make two separate consistencies of icing. A thicker icing, to be piped into borders. And a thinner icing, to be dyed poured into squeeze bottles, and used for flooding. I had a bit of trouble getting the consistencies right at first, but we were eventually able to get down to it. I made a large batch of white and poured it into the squeeze bottles before adding the dye. It was harder to mix the colors in this way, but I saved the hassle of making many separate batches. The cookies my friends decorated were incredible. Some were quite abstract. Others literal. Some used the cookie as a palette for a narrative. Others went sculptural. Here some shots of some of the best cookies (at least the ones that weren't eaten before the afternoon was over!). This year I also brought back the paint brushes, which I hadn't used since year one. They are a fun addition. This year I didn't buy any new sugar sprinkles, because I had so many left over from next year. This may also be the final year for the dragee. Which are very fun to decorate with, but aren't so fun to eat. One note about other decorations: I have a stash of different types of sanding sugars and sprinkles. Most supermarkets will sell a few varieties in the baking aisle. Sur la Table also has a good selection, but if you want to get serious about sprinkles, look for specialty store in your area. In New York City, the New York Cake and Baking Supply on 22nd and 5th is incredible. In Washington, I go either to Fran's Cake and Candy Supply in Fairfax, VA, or the Little Bitts Shoppe in Wheaton, MD. Sweetness Factor (not including decorations): 4; Indulgence Factor: 6; Difficulty Factor: 7: Chance I'll Make Them Again: 10. To prepare the cookies: whisk together the flour, baking soda, and baking powdered and set aside. In an electric mixer, cream the butter and the sugar. Beat for 2-3 minutes. Add all spices. Add the eggs one at a time. Then add the molasses. Mix until combined (if your butter wasn't totally room temperature, the mix may look globby here, if it doesn't come together go ahead and add flour). Gradually add the flour. Mix until combined. Divide the dough into three. One third at time, put the dough between two sheets of parchment paper, and roll it out to 1/4 inch thick. Stack the parchment flats in the freezer for an hour or so. More is fine too. Even over night. Preheat the oven to 350. One at a time, take the parchment flats out of the freezer, cut out cookies with your favorite cookie cutter, and set them on cookie sheets lined with parchment paper (note: if you are making multiple batches, you can reuse both the parchment sheets for freezing, and the ones for lining the cookie sheet, just make sure to remove any crumbs before putting the same parchment sheet back in the over). Bake for 12 minutes. Let cool on tray for a minute or so, then finish cooling on rack. The cookies store very well undecorated for a few days (or more) in an air-tight container. To prepare the royal icing. Dissolve the powdered egg whites in the water and lemon juice, and with a hand mixer or in a stand mixer combine with the powdered sugar. Beat until well combined. If the mix is too runny, add more sugar. If it is too stiff, add more liquid! Divide into small containers and add dye. If you want really consistent colors, you might want to add dye in a larger mixing bowl before moving to squeeze bottles. If you care less about that, you can add the dye once in the squeeze bottles and stir with a skewer or some such, the colors may end up a little bit marbled. When Newman's Own first started copying popular cookies, I was skeptical. I'd had Hydrox, and they are just not as good as Oreos. But I decided to give them a go anyway. I started with the Fig Newman. Turns out, it puts the Fig Newton to shame. It is more flavorful and doesn't have that I-was-made-with-crisco chewiness of the Fig Newton. Next stop, Newman-Os. I skipped the traditional chocolate and went for the ginger: the Ginger-O's. Well, folks, they're delicious. The are great to gobble up plain. They are ideal for dipping in hot chocolate. They open up nicely for a homemade double-stuffed. Best of all, they are fantastic crumbled with a mortar and pestle, sprinkled on raspberry sorbet, and drenched with chocolate sauce. You may notice a pattern here. Many baked goods that enter my house, suffer a similar fate. If anything was ever trendy right now in the cooking/baking world it is making from scratch something that is much easier to buy at the store. Pop tarts. Yogurt. Pasta. Ricotta. Marshmallows. And, of course, Oreos. I'm totally on board with this trend. I like the challenge. "You have an industrial kitchen (a factory even) and hundreds of employees? Ha. I have a kitchen aid mixer and a stubborn streak. I can do anything you can do!" I can make Ginger-O's. Okay, well, it turns out I can't. But, I can make gingersnap sandwich cookies, that, if I do say so myself, are pretty damn good. To start, I turned to one of my favorite food bloggers, who had recently adapted the Oreo for the home kitchen. I used her gingersnap recipe and an adaptation of her oreo creme recipe. And then I adlibbed. Why stop with a sandwich cookie, when you can have a sandwich cookie dipped in dark chocolate? Why stop with a chocolate-dipped sandwich cookie, when you could sprinkle that chocolate with sea salt? Why stop with a sea salt-sprinkled, chocolate-dipped sandwich cookie, when you could also sprinkle on some raw sugar? And let's stop there. Yum. To be sure, these cookies have a lot going on. But somehow it all works. It worked especially well after they sat for a few days and the cookies got a bit softer than they were when I first baked them. I thought I wanted a very crisp cookie, so I went for the longer end of the bake time. When I make these next, I will go for the shorter end, perhaps 12 minutes instead of 14. But this is to your taste. I like the crispy cookies on their own, but when you bite the sandwich, if the cookies are too crispy, the creme squirts out the sides. Slightly softer is better. More of a coherent cookie experience. The chocolate dipping is definitely optional. I love them this way. But adding the chocolate is what my mother would call gilding the lily. If you are trying to make a cookie that will stand out at your office holiday party or will really wow your friends and family, then why not gild away? Sweetness Factor: 7; Indulgence Factor: 8; Difficulty Factor: 7; Chance I'll Make Them Again: 8. Note: The ginger syrup is by Morris Kitchen. I bought it at a small shop in Philadelphia, but it is available online. You could also make some from scratch. To prepare the cookies, whisk together all the dry ingredients (the flour, baking soda, salt, and spices). Set aside. In a stand mixer, cream the butter and the sugars. Beat a few minutes, until fluffy. Add the molasses, the egg, and the crystallized ginger. Beat until thoroughly combined. On low speed, gradually add the dry ingredients. Once the flour mix is completely combined, dump the dough onto a piece of plastic wrap. Wrap it up and chill for about two hours. Preheat the oven to 350. Line baking sheets with parchment paper. Roll the dough into balls of about 3/4 inch in diameter. You can make them bigger if you want, but these cookies are intense enough, that I think it is better to keep them pretty small. Bake for 11-12 minutes. I let the cookies cool, stored them for the night, and made the filling the next day, but you could go ahead and start the filling while the cookies are cooling. To make the filling, combine all the ingredients in a stand mixer and beat until thoroughly combined. To assemble the cookies, you can either use a pastry bag, which take longer to set up but is then neater and more efficient, or a teaspoon. Match the cookies, so each has a partner that is evenly sized. On the bag of one of each pair, put a dollop of frosting. About two teaspoons worth. Sandwich the cookies together. Melt the chocolate in a double-boiler. Once it is melted, remove from heat and add the butter (or you could use vegetable oil). Stir in, until butter is melted too. Let the chocolate cool until close to room temperature. If your house is anywhere as cold as mine (63 on a good day) you might not want to wait to long because the chocolate will set very quickly. Dip each cookie 1/4 to a 1/3 in to the chocolate. Lay it on a piece of parchment paper, and don't move it until the chocolate is set. Let sit for a few minutes and then put a pinch of salt and a sprinkle of sugar on each cookie. Once the chocolate is totally set, the cookies should keep very well in an airtight container for a few days. You may want to separate each layer with a piece of parchment paper, but this is only important if you are very worried about presentation and want the cookies to stay very pristine. By popular demand, a beanie brownie! I made these for the first time last year at the request of a friend who wanted a chocolatey dessert but was on a strict low fat diet. They are surprising. They are dense and fudgy, but not too heavy. The beans lend a subtle earthiness that makes them taste hearty but not too much like health food. Actually, they taste a bit like a more delicious version of a chocolate power bar. I guess that may sound unappealing to some. But for me in conjures up a strong and happy memory of long bus rides to high school cross-country meets. There are a lot of versions of these brownies out there. This one, from 101 Cookbooks, promises to be truly yummy, but in addition to the beans, it contains both butter and eggs. I thought that if I was going to add beans to my dessert, they should at least be performing some central function, so I went in a different direction. The recipe below is completely vegan (unless you count the real butter I used to grease the pan, oops). These are great as dessert or as a protein-rich snack. If I still ran (or really exercised at alll), I would pack one of these to eat an hour before the run. Instead, I'll just have a piece after dinner with a scoop of raspberry sorbet and some chocolate sauce. Overkill? Maybe. All in all, however, although I thought these were pretty tasty, I guess I might not make them again. Or I might try the 101 Cookbooks version. Don't get me wrong, I gobbled these up, but I eat a lot of beans anyway, so I don't need the two for one that these provide. Sweetness Factor: 7; Richness Factor: 6; Difficulty:3; Chance I'll Make it Again: 4. Preheat the oven to 350. Grease a 9*13 inch glass baking pan. Line with parchment paper and grease the parchment paper. Add all the dry ingredients to a bowl and whisk thoroughly. Chop up the chocolate and melt in the microwave or in a double boiler. Combine all the other wet ingredients (including the beans) and puree until smooth. Add the melted chocolate to the other wet ingredients. Slowly add the dry ingredients to the wet ingredients, whisking until thoroughly combined. Pour the batter into the prepared pan. Bake for about 25 minutes, until the center looks set. Eating at my parents house is an art. Meals are thoughtful--balanced and flavorful. Afternoon snacks are serious productions. For the few days surrounding Thanksgiving, the kitchen is the center of all activity. All morning is a rolling breakfast, accommodating those who wake up early and those who straggle in toward noon as the early risers are starting to think about lunch (or second breakfast). Although the focus is, of course, on preparing the Thanksgiving dinner itself, no other meal is neglected, and this year our Thanksgiving eve dinner was a feast all in itself. My sister made a barley, white bean, kale risotto that was other-worldly. I will share the recipe with you just as soon as I learn how to make it. I was in charge of dessert, and, at my mother's request, made an old family favorite--Maida Heatter's Moosehead Gingerbread, which I have raved about before. Gingerbread, which, if it has a season, is probably a winter dessert, is always cozy and hearty. It tastes like being home tucked in during a snow storm. With extra spice, it tastes like being home tucked in during a snow storm with all your closest friends having a dance party. I guess what I'm trying to say is that I LOVE gingerbread. I love it made into a cupcake with chocolate ganache frosting. I love it plain with a cup of coffee for breakfast. Gingersnaps are good too. I guess the common denominator is the combination of ginger and molasses. When my mother mentioned she had a bottle of ginger liqueur to flavor some whipped cream, it occurred to me the combination might make a good cocktail too. Ginger liqueur, plus molasses, plus bourbon? If you've tried out something like this and have a good recipe, please tell me about it! Over the years, I have enjoyed a number of different gingerbread recipes, but this one is my go to. First, it is incredibly easy. Second, the powdered mustard and the coffee give the flavor a rich complexity that is unrivaled in most other recipes I have tried. The texture is cakey but not too dense. It isn't particularly sweet. It is great on its own or with ice cream. In fact, I bought an ice cream panoply to accompany this dessert: a pint of ginger ice cream, a pint of hazelnut gelato, a pint of raspberry sorbet, and a pint of spicy chocolate ice cream. Between the eight people at the dinner table, we tested out a number of combinations, and everyone was satisfied. Personally, I went for the spicy chocolate, ginger, gingerbread trio, and yum. Usually, I follow this recipe exactly, but, as I was preparing the batter, I found a box of crystallized ginger on the counter. I thought it might be tasty to chop some up throw it in the batter, and let it sink to the bottom (it is a pretty runny batter). I decided to use my parents' old coffee grinder (turned spice grinder) and quickly learned that the grinder doesn't chop crystallized ginger into small pieces; instead, it turns the ginger into a paste. Oh well! I threw it on in to the batter. The ginger flavor in this version is stronger, but, I would argue better! If you want a milder version, you can leave out the extra ginger. Sweetness Factor: 5; Indulgence Factor: 5; Difficulty Factor: 3; Chance I'll Make it Again: 10. Preheat the oven to 375 and butter and flour a 9*9 baking pan. In a small mixing bowl, combine all the dry ingredients and whisk thoroughly together. In a stand mixer (or with hand mixer), cream the butter. Add the sugar, and beat for a few minutes. Add the eggs one a time. I find that because there is so little sugar in this recipe (and because sometimes I don't start with room temperature butter) that sometimes the batter looks funny at this stage (globby), but don't worry, just keep adding ingredients, scraping down the sides, and beating. It comes together in the end! Add molasses. Beat until smooth. Add the coffee to the boiling water and stir to dissolve. On low speed, alternate additions of the coffee and the dry ingredients, starting with the dry ingredients. Beat until smooth. As I said above, this is a pretty runny batter. Don't worry! Puree the crystallized ginger (you could also just chop it finely, for a different effect). Add to the batter and beat until just combined. Pour batter into the prepared pan and bake about 35 minutes, until a tester comes out nearly clean and the top springs back when lightly touched. Cool in pan about ten minutes. You can remove from pan, or, for a less formal presentation, serve directly from the pan. In yet another example of my getting carried away, I recently volunteered to make a sixtieth birthday cake for forty. Ok, I admit, I really just wanted an excuse to break out my twelve inch cake round. Yellow cake with lemon curd was requested. I know, an unchocolate birthday cake. Don't worry, I snuck in some chocolate in the decoration. I went back and forth but ultimately decided that three layers was the way to go. I had settled on a buttermilk yellow cake recipe, and every other time I've made a buttermilk yellow cake, the cakes barely rose. Of course, this time, they rose like gangbusters. Madison has had the same problem. It's still a mystery. The recipes below are all for a nine inch, two layer cake. Each twelve incher is one 9 inch layer cake recipe. If you're counting, that means there were 12 eggs in the cake itself, let alone the curd. I love curd as a filling for cake. Especially on a three layer cake, it seems important to me to fill with something different than what you frost with; otherwise, each piece just has way too much frosting. Lemon curd is especially nice. This one is a very basic recipe from the New York Times Dessert Cookbook. I made it about two thirds of the way through following the recipe exactly, before I started to panic that the curd wouldn't set thick enough to hold up the weight of so much cake. I decided to fall back on some trusty cornstarch. I dissolved about two teaspoons in water and threw it in. I don't think this was at all necessary, but it gave me piece of mind. My curd would not collapse under the weight of two towering twelve inch rounds!! Note: It is a good idea to make the curd a day in advance of cake assembly, to make sure it has plenty of time to chill and set up in the fridge. Assembling this cake is definitely the fun part. With such large layers, stacking is exhilarating. It always involves just a few seconds of this might not happen, this might be a disaster, and then it happens, and it is not a disaster, and I feel extremely accomplished. Decorating, on the other hand, does not leave me feeling extremely accomplished. It leaves me feeling, well, inept. Usually, I cover for this by avoiding anything to do with pastry bags, decorating tips, and sugar flowers, and make my cakes look pretty by sprinkling on gobs of store bought sprinkles. This time I turned to my roommate, who we'll call Burke (A British American revolution sympathizer, in case you were wondering), who happens to have had a former career at an illustrious bakery in Boston. And check out that chocolate writing! Perfect! My original plan was to frost with a lemon glaze, but when I realized how big the cake would be, I decided to go for something a little more showy. This was my chance to final master the seven-minute icing. Well, I think I made progress. The first time (and before this, the only time) that I tried to make a seven-minute icing, it never properly transformed from whipped egg whites into marshmallowy goodness. It didn't taste particularly good, and it looked even more disgusting. This time, I was determined. I whipped those eggs for way longer than seven minutes, and transform they did! Into gooey, sweet goodness. I made one fatal miscalculation, however. Following the advice of Martha Stewart, I had (while making the lemon curd the day before) put the egg whites into an ice cube tray to freeze separately for future use (not realizing future use would be the next day). The problem is that it turns out that my ice cube trays hold slightly less than a full egg white per container. My seven minute icing didn't have quite enough egg white in it, and it never properly set. Over the course of the evening, more and more of the frosting slid slowly down the sides of the cake. No one seemed to notice. But the next day, when I went to eat my cake leftovers that I had been sent home with, the frosting had fallen off completely. But before the slow frosting slide, the cake survived the five mile ride in the trunk of my car. I don't think I've ever been honked at for slow driving so many times in my life! It survived the trip from the car to the kitchen counter. It survived being removed from the box my roommate had carefully fit around it. And none of these moments was quite so scary as the one in which I realized that it would be my responsibility to cut the cake. I've made wedding cake before, but at the critical juncture of eating time, have always gratefully passed it off the caterer, always a seasoned cake-cutting expert. So, in case you can't tell from the picture below, this is an area in which I need practice. I cut pieces that looked more like tall cake towers than slices of cake. I guess I need another occasion, so I can make another cake this big, and get another chance to get it right. Sweetness Factor: 7; Indulgence Factor: 7; Difficulty Factor: 4; Chance I'll Make it Again: 10. Recipe over here at Smitten Kitchen. Again, recipe at Smitten Kitchen. Thanks Deb! Total time: 5 - 24 hours (1 hour active). In a double boiler (or if you're me, last week, before your roommates got you an AWESOME for real double boiler, in a ceramic bowl perched on top of a saucepan), combine egg yolks, lemon juice, and zest. Whisk in the sugar. Whisk, over simmering water, until it starts to thicken. At this point, and you're a "it won't thicken" panicker like me, add some cornstarch dissolved in water. If you have a bit more faith, skip this step. Once it starts to thicken, remove from heat, add the butter, cut into tablespoon or so size tabs, one piece at a time. Once butter has completed melt and is thoroughly whisked in, place the bowl in an ice bath and let cool. Once it is room temperature, cover, and refrigerate until you are ready to use it. At least five hours. I'm a day late, and a few prep pictures short, but I need to share this one anyway. Yesterday, for anyone out there who didn't notice, was the one-eist day most of us will experience during our lifetimes. I celebrated twice, at 11:11 AM, and at 11:11 PM. And I made these chocolate gingerbread cookies in honor of the occasion. I followed this Martha Stewart recipe exactly, so I won't repeat it here. I will say though, that I never fully appreciated how great cookie cutters are until I tried to make shaped cookies free form. As you can tell from the pictures, I got lazy after making quite a few proper ones and started making thin lines, which, conveniently, doubled as slashes for writing out the date. The cookies themselves were delicious, achieving a delicate balance of chocolate and ginger that didn't drown out either flavor. They might make an appearance at this year's holiday cookie decorating fiesta. Here they are: 11/11/11, 11:11 cookies! Sweetness Factor: 7; Indulgence Factor: 6; Difficulty Factor: 9 (without a cookie cutter, 5 with); Chance I'll Make them Again: 9 (with a cookie cutter, 4 without). I got my apple picking in just under the wire this year. By the last weekend in October, most of the Orchards within a reasonable drive of the city are close to picked out. Any apples left worth eating are well out of reach. At the Orchard I went to (Stribling, in Virginia), they were passing out apple picking poles, which I unfortunately didn't get any pictures of. They are about ten foot long wood poles with a wire basket at the end. And let me tell you, they are not so easy to use. In the end, my friend and I resorted to climbing the trees, and, as a result, came away with ten pounds of apples each! I planned to make an enormous apple crumble, but came to find my roommate had just made one with the apples I foolishly bought at the store the day before. I decided instead to try to recreate the apple cake that Stribling sells in its bakery. A small loaf cake, it was crusty on the outside and light on the inside. It had subtle hints of cinnamon, but nothing overpowering. I asked for the recipe, but they don't give it out. I scoured all my recipe books looking for something that seemed like it would approximate the same result. The closest I found was an apple cardamom muffin from the Metropolitan Bakery Cookbook. Reading this recipe reminded me why that bakery is so delicious: it called for three sticks of butter, four eggs, two cups of heavy cream, and a cup of sour cream. Now, I'm definitely not adverse to following that recipe exactly, but the last two ingredients I just didn't have in the house (I don't even have milk, since my roommates decided to experiment with substituting almond milk for the real thing, mostly a success so far), and I was stocking up on butter for a serious cake project (stay tuned on that), so I set to work at revision. Heavy cream = almond milk. Sour cream = plain yogurt. Three sticks of butter = two sticks of butter. Four eggs = three eggs. Lastly, cardamom = ginger. No offense to cardamom, I just don't love it. Not quite following the instructions on the proper apple to batter ratio, I ended up with muffins that nearly fell apart because of their heavy apple content. And they were perfect--with a nice crust on top, a substantial mouthful of apple in every bite, and a moist but not too heavy and not too sweet muffin base. Where I went wrong was what I decided to do after putting the first dozen in the oven. I didn't want to wait and make a second batch (I only have one muffin tin, so I can only do twelve at a time), so I through the rest of the dough and batter into an 8*8 and then accidentally underbaked it. The dough to apple recipe was way too high. Next time, I will either cut the recipe in half or I will make it when I have enough time to go through too rounds of baking. Sweetness Factor: 5; Indulgence Factor: 5; Difficulty Factor: 4; Chance I'll Make it Again: 8. Preheat the oven to 375. Prepare muffin tins (either with paper inserts or with a thorough buttering). Peel, core, and chop the apples. Combine about the apples in a saucepan with the other filling ingredients. Remove about 1/3 the apples and set aside. Bring to a boil. Reduce heat and simmer until the apples are soft. Finely dice the remaining apples (I went for more of a rough chop -- depends on how chunky you prefer the ovens). Once the cooking apples are soft, mash them a bit and add the remaining apples to the mix. While the apples are cooking down, combine the flour, 1 1/2 cups sugar, baking powder, ginger, salt, and brown sugar in a stand mixer. Cut the butter in small cubes and toss with flour/sugar mixture. On low speed with paddle attachment, mix until the butter is nearly combined (should resemble a course meal). In a separate bowl, whisk together the almond milk, yogurt, and eggs. Add to the flour mixture (on low speed) and blend until just smooth. Fill the prepared muffin tins 1/3 - 1/2 full with batter. Put a healthy scoop of apples onto each muffin and cover with another dollop of batter. Sprinkle with the remaining granulated sugar. Bake 20 minutes until a wooden skewer comes out clean (when stuck into a batter part of the muffin). Allow muffins to cool in the pan for about five minutes, then remove and eat while still warm (although they're also pretty good the next day)!